We thank Robin Bridges for letting us interview her. 1) The Katerina Trilogy is a paranormal historical. How did you decide to write this story and why for young adults? Russian history is teeming with superstition and mythical creatures. It wasn’t hard for me to imagine a Saint Petersburg filled with vampires and other monsters. When I reread my favorite Russian fairy tales about Koschei the Deathless and Baba Yaga, I also read about firebirds and bogatyrs. Digging into other Eastern European mythology, I discovered veshtizas and strigas. I could see all of these creatures involved in a power struggle behind the scenes of the Imperial Court. Nicholas Romanov and his oldest siblings were teenagers during the late 1880’s and early 1890’s, so it made sense to me to center the story on a group of Imperial teens who were caught up in this power struggle. 2) Your descriptions are so rich, the reader is transported to Saint Petersburg, 1888. Have you been to Russia and which historical details did you think were important to include? Thank you! I haven’t been to Russia yet! Hopefully one day. The main goal of my research was to make the setting come to life, so I focused on the palaces my characters lived in, and their clothing and food. The education of young noble women, especially at the Smolny Institute, was another important part of my research, since Katerina spent so much time focused on her studies. 3) Which scene was difficult to write? I always find it challenging to write the big action scenes. I try to always act them out in my living room to get a feel for the movement and the space, like blocking a scene for actors. The TV has stood in for a sacrificial altar. I tried to convince Oedin, my 200lb mastiff, to be a ceremonial magician, but I don’t think he has the aptitude for it. 4) Since Katerina's first story has been so well received, did you feel any extra added pressures while writing The Unfailing Light? And for the last book in the trilogy? The first drafts of the second and third books were already written by the time The Gathering Storm was released, so I didn’t feel that pressure. 5) Are you a pantser or a plotter? Any advice for beginning writers? I’m a plotter- I like having a very rough outline before I start writing, but I also love being surprised by twists and turns that pop up along the way. My advice to beginning writers is to write the stories that you like to read. Even writing fan fiction helps you learn! 6) Some have criticized YA as being "too dark". Your thoughts? Some YA fiction is dark, but the young adult years can be dark, too. And you have different kinds of “dark”. The Katerina Trilogy is dark in an atmospheric sort of way, but books like Speak by Laurie Halse Anderson explore dark subject matter. 7) Who would you cast in the leads for a movie version? You can’t cure the romantic in me. (Please don’t laugh!) When I started writing the first draft of The Gathering Storm, I imagined Katerina being played by Emma Watson and George being played by Tom Felton. By day, Robin is a mild-mannered writer of fantasy and paranormal fiction for young adults. By night, she is a pediatric nurse. Robin lives on the Gulf Coast with her husband, one soon-to-be teenager, and two slobbery mastiffs. The Gathering Storm is her first novel. 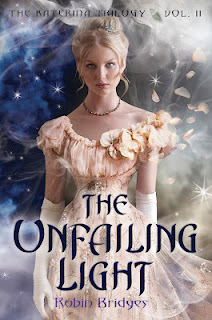 Reading The Gathering Storm (my review) and The Unfailing Light back-to-back has been a treat I'm not usually accustomed to having with series. Katerina is back and there are changes in store for our headstrong young protagonist! She is now on holiday in Greece with her mother and cousin Daniya and they go to tour some local caves. Katerina's first surprise is to see George on her way up to the caves and we learn even though she did not accept his marriage proposal, he is adamant in taking a year to get his parents to accept her. In a way this wonderful couple are very much alike in their stubbornness While in the cave she has a strange experience and enters the grey--the place between the land of the living and dead--where she encounters her arch nemesis. When the tsar hears of the occurrence she is ordered to return to Smolny Institute. I was so sure Katerina would find a way to leave the school and go to Vienna to begin her medical school studies, but with George's pleas and the empress casting a spell on the school to protect the tsar's necromancer, Katerina stays put. Of course, trouble follows her and before her corset can be tightened any further, a malevolent spirit is unleashed inside the school. Oh, and since full fledged vampire Danilo drank her blood, they share a telepathic bond. Thankfully, Robin Bridges keeps Katerina loyal and in love with George--this is a no love triangle zone--no matter how good looking the Montenegro heir is. What I have come to love about The Katerina Trilogy are the period details, the independent thinker Katerina, her amazing necromancy skills, the rapport between her and George, and the twists the story takes which keeps me on my literary toes. The steady pace always retains my interest and I'm so engrossed in the story, I forget I'm reading a book. Too bad I have to wait until 2013 to read the final book in the series. Favorite excerpt: "George's eyes narrowed. He was angry with me for being stubborn. Without thinking, I reached for his hand and held it between both of mine. "Don't be mad. And please don't worry about me. The Order needs to keep the tsar safe. Konstantin is not concerned with me." Not much, I hoped. George's breathing had changed when I touched his hand. He was still angry, but there was something else that flashed in his eyes as well. Something silvery and dangerous. His fae heritage. "God, Katiya," he murmured as he dropped the picnic basket and pulled me closer to him. His lips brushed mine, and in a heartbeat, the rest of the world fell away. All my fears about the lich tsar, all my worries about medical school. I let go of his hand and put my arms around his neck. I knew the others weren't far ahead of us and would probably turn around if they noticed us missing. But I didn't care about anything at that moment. Nothing but being in that beautiful boy's arms. My beautiful boy." Book source: I received an ARC of this book in return for my honest review during a book tour. I read The Gathering Storm last year and I liked it but was a little overwhelmed with all the similar titles and the many paranormal that graced the pages. But this second book totally blew me away! I absolutely loved it! I wasn't confused or overwhelmed anymore, it was perfect! So glad you enjoyed it! And I enjoyed getting to know the author a bit better too! Thanks for stopping by. I'm glad you enjoyed The Unfailing Storm. I really enjoyed it and can't wait to read the next one!